Turning the conventional wisdom on its head, Janine Benyus, author of Biomimicry: Innovation Inspired by Nature and founder of the Biomimicry Institute, argued that carbon dioxide pollution in the atmosphere can become the source of a new, regenerative agricultural system at SXSW Eco in Austin, Texas. Instead of treating carbon dioxide emissions as a waste product that needs to be reduced, it can instead fuel our food production. We can mimic the functions of prairie ecosystems to store all of that excess CO2 and create a more sustainable food production system. “Nature has no landfills; everything has a second life,” Benyus argued. Carbon dioxide is already the basis of a complex system of “upcycling” in nature. A tree absorbs carbon dioxide, sequestering it as it grows. When it dies, it’s decomposing trunk is taken over by fungi, which consume the carbon. This fungi is then eaten by voles, which are then eaten by owls, and on the cycle goes. 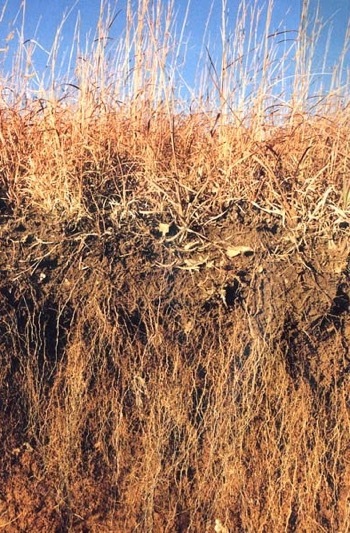 In contrast, in prairie ecosystems, where there are perennial grasses like wheat, plants store carbon deep in the soil through long roots, some that go as far as 20 feet deep. Prairie grasses evolved the ability to do this. In a fully-functioning prairie, bison and other grazers would prune grasses all the way down to the ground. To survive, these grasses had to store much of their energy (and carbon) way down in the roots. Sustainable agricultural practices that preserve perennials through the use of crop diversity could then not only produce food but also help us store the excess carbon in the atmosphere. Restoring the natural ecosystem functions of grasslands, as well as forests, has other benefits. Scientists have found that plants work together in a natural “world wood web” to communicate and share resources underground, with the aid of “common mycorrhizal networks,” systems of fungi that are helpers of plants. These fungi colonize plant roots and aid in phosphorous, nitrogen and water absorption from the surrounding soil and then they form networks in between the plants. For example, under a forest floor, there is a web of life, “a chemical conversation” that leads to constant interchange. The conversation is about opportunities, like new resources, and threats, like insects. She explained how in a functioning ecosystem carbon stored in roots under a tree could end up being transferred to where it’s most needed, perhaps to a shrub a half a mile away. Mycorrhizal networks then increase the amount of carbon that can be stored exponentially. In monocultures, this mycorrhizal communications network has been told “we don’t need you.” Tons of bags of phosphorous and nitrogen are dumped on fields each year. In these farmlands, the underground conversation is over. There is no longer any exchange of carbon, water, and nutrients, and the subterranean communications network dies. To recreate this natural of nutrient exchange and removal, industrial corn and wheat fields in the Midwest use poorly-designed drainage pipes to carry water and chemicals, which then make their way to the Mississippi River and out to the Gulf of Mexico, where they create enormous dead zones. That system is clearly not optimal. Benyus thinks growing demand for organic food can help restore natural agriculture systems’ bio-sequestration function. Some 70 percent of produce is grown by small shareholders, who account for a third of humanity. These farmers in Africa, India, South America, and Southeast Asia have been largely left out of the “green revolution,” which involved Western aid agencies pushing large-scale industrial farming techniques on developing countries. According to Benyus, more and more large food manufacturers are contracting out with small-scale shareholders because industrial farms can’t keep up with demand. These farmers commonly support a diversity of crops, don’t grow monocultures that strip the soils, and therefore have less need for added chemicals. It’s important that these small shareholders keep doing things the way they have been, Benyus said. And the 6.8 billion acres of degraded industrial farmland on the planet provide an enormous opportunity. If that land was healed using sustainable farming techniques, the impact could be significant. Biomimetic approaches could also be used to improve water efficiency. New filtering technologies that mimic aquaporins pull out pollutants by attraction rather than pushing them through a membrane that can easily get clogged. “Imagine a giant tea bag that with antibiotics jumping into it.” Gardeners and landscape architects are experimenting with bio-irrigators, plants that naturally redistribute water. “Some shrubs have both shallow and deep roots. They use the deep roots to push water far down into the soil where they bank it for later use. Then, when they need it, they pump it back up and distribute via shallow roots. These plants help each other. It’s a self-watering landscape.” Another firm in Australia has created a natural septic system based in soil profiles. In this system, clean water eventually percolates back up to the surface. To learn more about this concept, check out Peter Byck’s film Carbonnation. See some short clips and related TED talks. Sounds familiar. Permaculture? The Land Institute? Good to keep getting this message to new audiences. Big Ag will never change… it has been this way since Secretary Earl Butz set up today’s current ag policies in the Days of Nixon. Just to give you an example of how bad it is, The Ag Lobby is dead set against the Open fuels Standards Act, which would allow Methanol to become an approved fuel for cars. There is no possible way for Ag to meet the total demand for fuel for cars with ethanol (but together with methanol they could) and they even must use methanol (as a catalyst for the production of Biodiesel) and yet they are fully intent on keeping methanol from becoming a part of the vehicle fuel equation. Farm sizes continue to get larger because the only way for farmers to make a profit on razor thin profit margins is to ever increase their production volume. More and more Class A farm land is purchased by foreign investors as well as non farm investors. Every one wants a piece of a farmer’s hide but no one but farmers are actually interested in doing the work. Since the average age of farmers continues to get older, who will farm these farms in the future? The US government has used food exports as a weapon and given where the world population and global climate change is headed, will be tempted to use this leverage ever more frequently. All the while adding to the mono crop, unsustainable agricultural practices that continue to cause major environmental problems for US citizens. The USDA is equally responsible as they have set food standards influenced by the Corn lobby in which 10,000 or more products in the average grocery store have corn or corn by-products as ingredients. It is no wonder that US citizens have weight issues and high instances of diabetes. One would expect the high cost of healthcare alone would dictate a change in these policies set by the USDA.